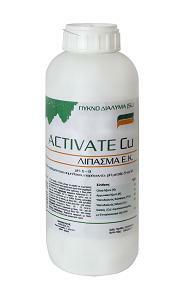 Activate Cu, is a liquid fertilizer which contains ”Organic” copper. Composition: Nitrogen (N): 5% w/w, Phosphorous (P2O5):8% w/w, Copper (CuO): 3.5% w/w. The nitrogen and the organic molecule facilitate the mobility within the plant tissue. Is easy absorbable (nutritional effect both through the leaves and through the roots), as well moves inside the plant tissue as other plant nutrients, improving copper efficiency and allowing to reduce the copper amount and chemical molecules.